Years back, pressing the guide button on your remote and browse through TV listings was a luxury. It meant being able to see what was playing without channel surfing or purchasing a physical TV guide. But these days, the idea of scanning through even a digital guide strikes many of us as downright tedious. We search online instead. 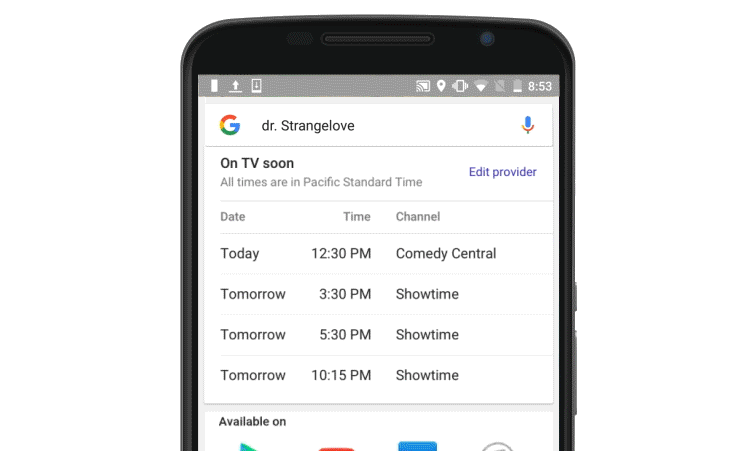 And pretty soon, Google will start displaying live TV listings at the top of search results when you look for a show. The box displays which day, time, and channel the show will appear on. This is cool, but it's not all Google is doing for the TV industry. The company is introducing DoubleClick's Dynamic Ad Insertion. This takes Google's personalized ads and transfers the experience to wherever you watch video. Google says the ads will work for both live and on-demand TV, along with content that's directly sold and programmatic. Google has already tested this functionality during the Rugby World Cup Finals on TF1 in France and the Republican Presidential Debates on Fox News in the US. In a world where people don't watch the same shows, don't read the same news, or accept the same facts, why should we have to watch the same ads? For more on how Google's interacting with the TV industry, hit up the source link below.